Saint-Gobain CHEMFILM® ETFE-E2 extruded fluoropolymer film is a copolymer film consisting of ethylene and tetrafluoroethylene resin. CHEMFILM ETFE-E2 is resistant to chemicals, weathering, stress cracks, and tearing. CHEMFILM ETFE-E2 consists of a 25µm thick copolymer resin. A diagram depicting CHEMFILM ETFE-E2 is shown in Figure 1. Figure 1. CHEMFILM ETFE-E2 diagram showing fluoropolymer film (25µm). CHEMFILM ETFE-E2 exhibits excellent dimensional stability, low surface energy, and mechanical properties. Saint-Gobain CHEMFILM is used extensively in many industries as an adhesive carrier, release liner and gasket material. The non-contact nature of laser processing allows applications to be processed with small features and fine geometry which might be difficult to achieve with traditional mechanical methods. 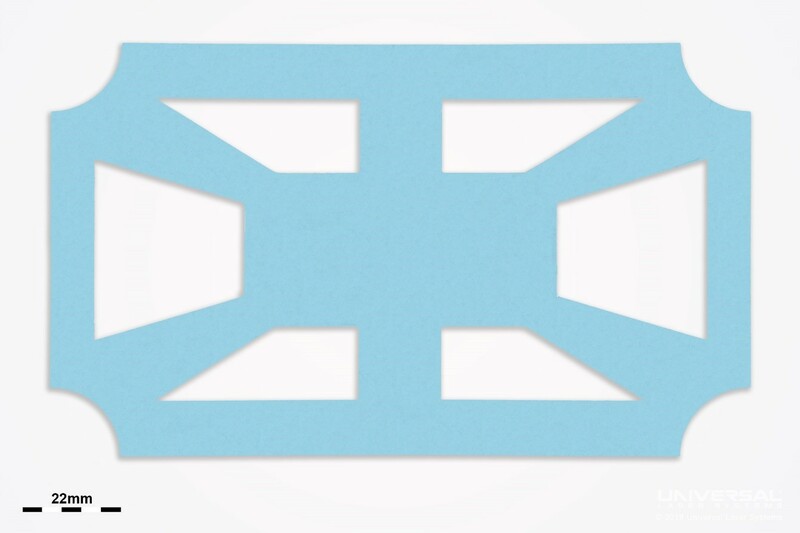 CHEMFILM ETFE-E2 is only suitable for laser cutting which produces consistent laser processed edges and minimal heat affected zones. Other laser processes are not suggested as they are not conducive to the intended use of this material. Universal Laser Systems makes it simple to consistently and repeatedly process this material to a high degree of dimensional accuracy because the non-contact nature of laser cutting eliminates material deformation during laser cutting. CHEMFILM ETFE-E2 was tested to assess laser processing compatibility and determine the best configuration of peak laser power and wavelength. The thin copolymer film CHEMFILM ETFE-E2 appears to absorb 9.3µm and 10.6µm energy with similar efficiency. A microscopy image taken at 300x magnification of the CHEMFILM ETFE-E2 edge after laser cutting is shown in Figure 2. 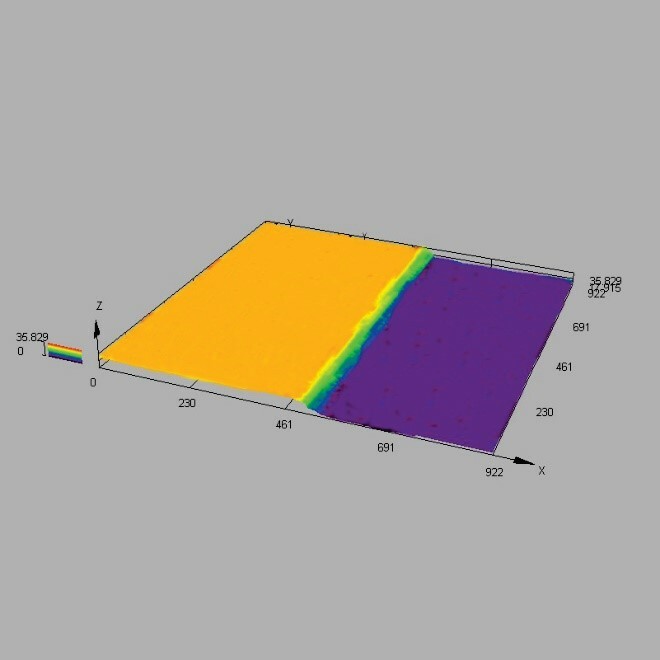 The 3D image in Figure 3 depicts how the processed edge of the epoxy adhesive responds to laser cutting with the system configuration of a single 30 watt 9.3µm laser. Figure 2. Microscopy image (300x) of the edge after laser cutting CHEMFILM ETFE-E2. 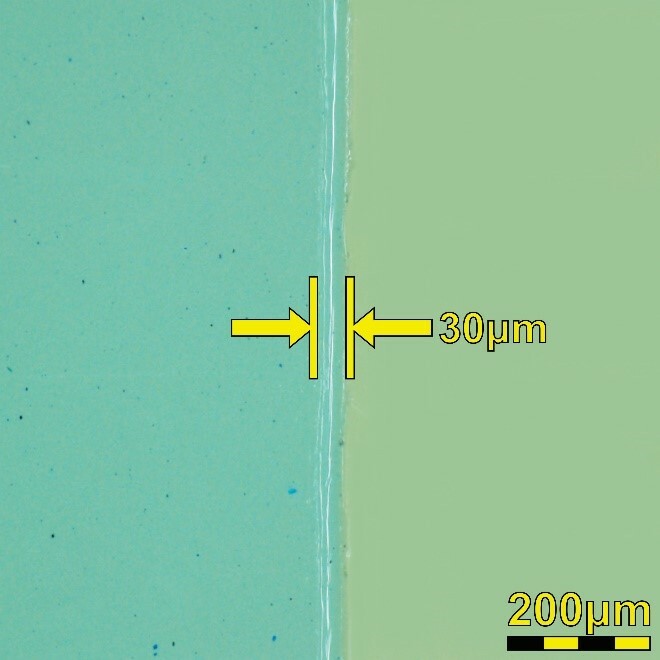 The heat-affected zone measures 30µm. Figure 3. 3D-rendered microscopy image (300x) of the edge after laser cutting CHEMFILM ETFE-E2. CHEMFILM ETFE-E2 applications requiring fine geometry and intricate detail without degrading the physical properties of the material can be accomplished with Universal Laser Systems technology. An example demonstrating the results of laser cutting CHEMFILM ETFE-E2 using the recommended system configuration is shown in Figure 4. Figure 4. Example of the geometry possible with laser cutting of CHEMFILM ETFE-E2. CHEMFILM ETFE-E2 is suitable for laser processing and was extensively tested to determine the optimal processing configuration. Through this testing it was determined that laser cutting is viable with this material and using a 30 watt 9.3µm or 10.6µm CO2 laser source is the best system configuration for the processing of this material. CHEMFILM ETFE-E2 efficiently absorbs the 9.3µm and 10.6 wavelengths of laser energy to produce a processed edge that has minimal heat-affected zone and discoloration.